‘Durham’s cathedral and castle form England’s most dramatic architectural composition. On a high rock over a tight loop in the River Wear, these two massive structures were built to assert Norman authority over a hostile North. 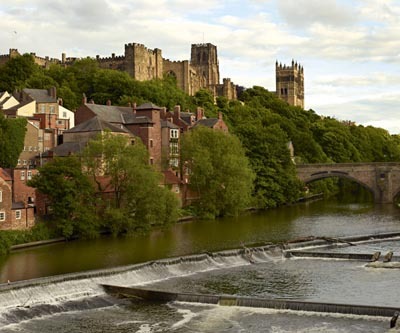 Durham is a city of views. Framwellgate Bridge leads from North Street across to the 300-yard neck of the Durham isthmus at Silver Street. Towering above the bridge is the castle. To the right, the cathedral rises over the trees, with two west towers and the central crossing behind.